Pagan's Path started on October 2nd, 1996, as a small education website hosted on a personal AOL screen-name/website. It was a modest attempt to share information on commonly asked questions on AOL. After several years of working on articles and AOL changes the modest education site expanded beyond it's current means. In March 1999 the official PagansPath.com domain was purchased and the site was officially rolled out on Ostara of that year. Over a decade later visitors to Pagan's Path have constantly asked if the site is in book form, or if Spring has written any books that could be purchased. With constant encouragement from visitors, family and friends, Spring took the advice to heart, compiled the writings from the first section of the site, expanded on them and Pagan Metaphysics 101: The Beginning of Enlightenment was born. Now you can take this research with you and read at your leisure. 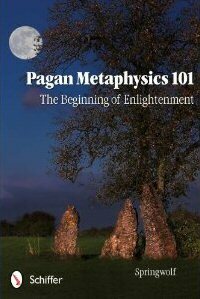 Pagan Metaphysics 101 is available now from Schiffer Publishing . You can keep up to date on book releases, appearances, news and schedule a lecture or seminar for your group's next event on Spring's official author's site @ Springwolf Reflections. You can also follow Spring on Facebook and Twitter. Gain an introductory understanding of metaphysical concepts from a pagan perspective, beginning with the first principles of the creation of the Universe through the Celestial Soul Groups and their influence upon the evolution of life and expansion of spirit. From basic metaphysical models, the reader learns about the anatomy of the Soul and how it is connected to the Spirit and the Divine Universal Energy. Answers are provided for important questions: Of what is the Soul made? How does it learn? Where are those memories kept within the Spiritual Being? How does the Soul connect through energy to the physical body, other spirits, and the Greater Divine Consciousness within the Universe? Through this learning process, individuals can walk through every moment of the day with a sense of higher purpose, greater connection to their spiritual mission, and with insight to meet their personal and spiritual goals.